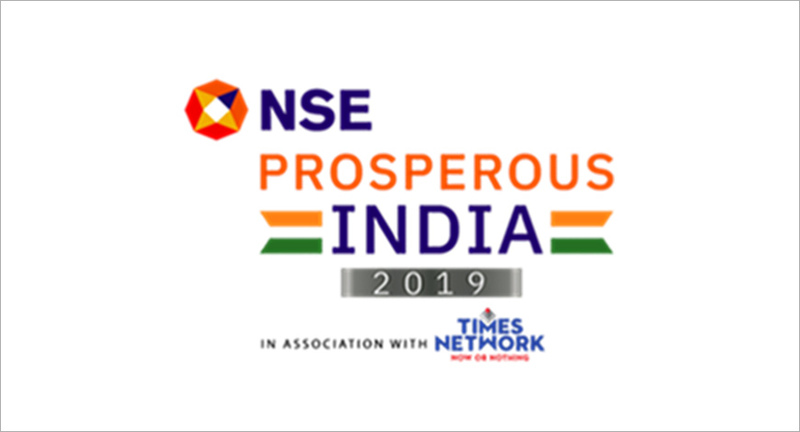 Times Network has joined hands with NSE to launch ‘Prosperous India 2019’, a path-breaking investor awareness initiative in Mumbai. The initiative aims to enable investors, stakeholders and public with financial freedom, prosperity and an opportunity to ‘Rise with India’. India is one of the fastest growing economies in the world and holds an advantage of a rising middle class across demography. ‘Prosperous India’ in its entirety is committed to improve the financial well-being of people with a focus to provide a platform to ensure financial security and sustainability for an investor to grow as India progresses. The launch event witnessed a fireside chat between Vikram Limaye, Managing Director and CEO, NSE and Nikunj Dalmia, Managing Editor, ET NOW on ‘Financially Sustainable India, A Prosperous India’. This was followed by a panel discussion on ‘When India Prospers, Investors Prosper’, moderated by Nikunj Dalmia with market stalwarts that included Vishal Kapoor, Chief Executive Officer, IDFC Asset Management, Manish Gunwani, CIO - Equity Investments, Reliance Mutual Fund and Lakshmi Iyer, CIO - Fixed Income & Head Products, Kotak Mutual Funds. Commenting on the initiative, Vikram Limaye, Managing Director and CEO, NSE, said, “Over the last 25 years, NSE’s commitment to investor education has been a continuous and consistent effort. As India’s largest exchange, we believe that one of our key responsibilities is to encourage more people to participate in India’s growth story and benefit from the growing Indian economy. The substantial increase in participation in equity and mutual funds in the recent years and broadening of the investor base is an encouraging development. We need to help our new entrants into the market and guide the investors, members and ensure all participants benefit from the market over a long term. This will keep the investors interested and drive the markets towards sustainable growth. The NSE ‘Prosperous India 2019’ initiative with Times Network is an important development and this launch event marks an important milestone. As part of the initiative, ET NOW will host 24 on-ground forums, reaching out to a wide spectrum of people across 12 cities – Mumbai, Bangalore, Kolkata, Indore, Lucknow, Pune, Ahmedabad, Hyderabad, Chennai, Jaipur, New Delhi and Surat. ‘Prosperous India’ will educate the masses on investment methods and trends thus enabling them to make the best returns as India Prospers. The initiative will culminate with a grand telethon on TIMES NOW, ET NOW and Mirror NOW.